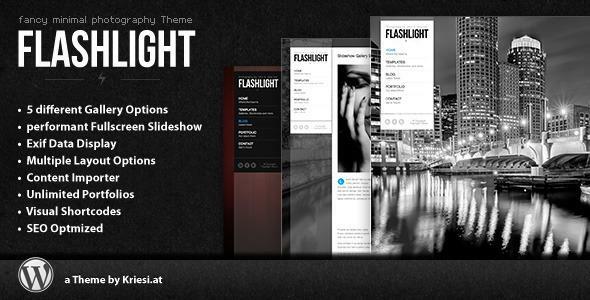 Flashlight – fullscreen background portfolio theme. Flashlight is an elegant and flexible WordPress Portfolio and Photography Theme, suited for users with no coding knowledge as well as deverlopers. The theme comes with a plethora of options so you can modify layout, styling, colors and fonts directly from within the backend. The gallery managment is super easy and convenient. Just upload your images, select a gallery type and hit publish. Want to build a gallery with dozenz of images in less than 2 minutes? This theme makes it possible. Fullscreen:The Fullscreen Slider will adapt to the screen resolution of your visitors and other than other themes will perform very fluid transitions, even on large screens with resolutions of 2500 pixels and above. Masonry Grid: A lazy loading grid gallery that doesnt crop your pictures. As known from facebook it supports infinite scrolling, meaning if the user scrolls down more images are loaded. That wayyou can easily share huge amounts of images. Inline Attached: Images are appended to your Post without cropping. The List of Images will display a smart tooltip with description and exif data on mouse hover. In addition to the images attached to the post you can also choose to display the images in the background so users can switch between slideshows. WordPress Default: The WordPress Defalt of embedding images is of course supported as well. Especially usefull if you want to display the Gallery somewehere between 2 content blocks since you can simply controll the output with the shortcode. The gallery managment is super easy and convenient. Just upload your images, select a gallery type and hit publish. Want to build a gallery with dozens of images in less than 2 minutes? This theme makes it possible . Bellow the fancy main menu in your themes sidebar you can add any number of widgets. You can choose to create widget areas that only appear on certain pages or posts if you wish to. Display your Projects well organized on portfolio pages so your visitors don’t get lost. You can set up any number of portfolio overview pages, portfolio entries and categories. Share the post "Portfolio theme Flashlight"